This jumbo sized cheese board will be a much appreciated gift. Laser Engraved with your company name and logo, this quality corporate gift is the ideal giveaway when you are out to impress. The high perceived value together with its green eco-friendly credentials will ensure Jumbo Party Plate takes pride of place. This impressive branded gift is made from renewable bamboo and ceramic and features a cheese knife as well as multiple snack compartments ideal for olives, crackers and other accompaniments. This promotional gift will be used in the office, at home and whenever cheese is being consumed. 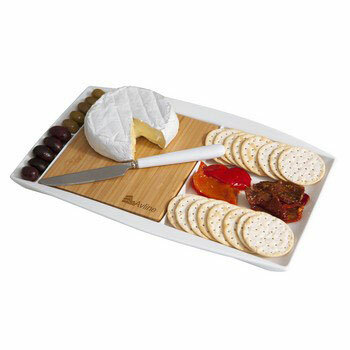 The bamboo cheese board is branded using a laser engraving machine which engraves your logo into the bamboo surface in 3 dimensions. The form of branding adds to the overall upmarket look and feel of this upmarket gift.